With the rising cost of fuel, even a diesel driver wants to know they’re getting the best fuel-consumption they can from their engine. The Ram 1500 offers just that, with its Class-Exclusive 3.0L EcoDiesel V6 engine. 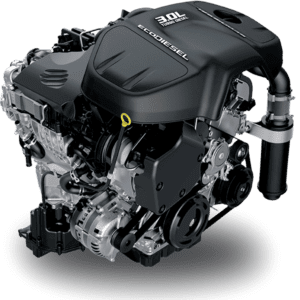 With the EcoDiesel engine, you can get the power you demand from a Ram truck, with the kind of fuel economy you’d expect from the average family sedan. The Ram 1500’s 3.0L EcoDiesel V6 may not have the total horsepower of the available 3.6L Pentastar™ VVT V6, or the 5.7L HEMI® VVT V8, but make no mistake—it’s no slouch. Topping out at 240 horsepower, it’ll give you the strength you need, when you need it. The EcoDiesel also outperforms both VVT engines on torque, providing up to 420 lb.-ft. at a remarkably low 2,000 rpm. With 9,200 lbs of max towing capacity, your Ram 1500 will still be unstoppable, meeting all the rugged challenges you’d throw at any diesel-powered truck. At 27 highway mpg, the 3.0L EcoDiesel V6 has the same kind of fuel economy offered up by the average family sedan, rather than a diesel-powered pickup. This impressive feat lands the Ram 1500 in the top-ten list for most fuel efficient diesel trucks, where it’s not easily outperformed. If fuel savings weren’t enough, the EcoDiesel also replaces the usual smell, noise, and emissions of a standard diesel engine with something more quiet and refined. Why take our word for it? You can try the 3.0L EcoDiesel V6 engine for yourself, and feel the difference, today. Get behind the wheel of a Ram 1500 with the EcoDiesel engine by contacting our sales team and booking a test drive.